Every makeup artist will agree that foundation is the most worry-inducing makeup product in our makeup wardrobes. When you use some other makeup products, for example eyeliner and you do something wrong, you have a bit of wiggle room and you can correct your mistakes. Bet when you use a foundation and you do something wrong there is no coming back and you can’t correct or camouflage the mistake. This is probably the reason why BB creams have become so commercial and popular. According to the recent research commissioned by Make Up For Ever through the research company The NPD group, about 73% of women confessed that choosing the right foundation can be a problem. Regardless of the rows of foundation shades which line shelves at shops, such as Sephora“ about 54 percent of women admit that choosing their color match is their worst problem. Also, 62% of women have problems applying foundation in the right way. Make Up For Ever is starting their Foundation Nation campaign to help solve this confusion. They will held more than 100 events at Sephora stores across the U.S. and Canada from July 15th to August 10th. 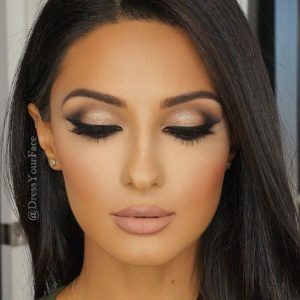 The company’s makeup artists will held an eye-to-eye consultations during these events to see what is the clients’ biggest foundation problems and explain to them how to use the right products and techniques to solve the problem. The company also cooperates with Troy Jensen, a celebrity makeup artist who worked with Elle Macpherson, Jennifer Lopez and Eva Mendes, to spread the gospel of impeccable foundation. At a seminar for editors, Jensen showed so much knowledge about foundation that even the makeup professionals were able to learn a couple of new tricks. Everybody knows that there isn’t any magic product which will not crease in fine lines, nevertheless there are certain methods that you can apply to keep creasing to a minimum. Jensen explained that she uses a tissue to blot off the eye cream because it is more likely that the foundation will crease if the skin is more emollient. He also said that after applying foundation, for lines around the mouth he uses a fine brush and just removes it from those lines. You should apply highlighter and then foundation. After applying foundation we have always whipped out the YSL Touche Eclat, but Jensen doesn’t completely agree with this. He said that he likes the glow to look more natural, from within and if you use full coverage foundation, it may look a bit matte or dull as the day passes by. He explained that if you want that glow you should have the highlighter underneath. Use a brush to apply foundation. About 50% of women don’t use a brush to apply their foundation, but Jensen and other makeup professionals agree that is very important to use a brush when applying foundation because it provides an even, impeccable finish. Jensen recommends a brush with a domed head, such as Make Up For Ever’s 152 Brush. You should do gentle, circular motions to rub foundation into your skin. If you follow this tip you will use less product and build coverage, because it is more difficult to take off excess foundation than to add some more. You should apply foundation everywhere (and I really mean everywhere). Also, it is very important to blend a light layer of foundation over your lids and lips. This technique will help your lipstick shades and your eye shadow go on truer to their shades. Jensen explained that when his clients who are famous want to go to some important event he must make their foundation to last for 10 to 12 hours and that product is crucial. He said that he uses a mattifying foundation, like Make Up For Ever Mat Velvet instead of applying a powder, because it may look chalky. He applies this foundation on oiler areas in the T-zone, and around the perimeter of the face he uses a dewier product. You should color correct deeper skin tones. Jensen explained that women who have brown skin should use an orange color corrector to prep their skin to counteract dark purplish tones under their eyes or around their mouth. He recommends MAC Cosmetics Studio Finish Skin Corrector in Pure Orange.